Stepping into the campus of University of Michigan, I was contented and proud, but at the same time, I realized that I was no longer a high schooler, but a college undergrad. This is a brand new chapter of my life and new goals are waiting for me to achieve. As a freshman at the University of Michigan, my very first goal is to explore the campus more because after all, this is where I will be spending the next four years of my life and this is the base for my success as a college undergraduate. Of course, I had some previous knowledge from my summer orientation at U of M, but as I moved here from Boston last fall, I realized that there was way more awesome stuff for me to discover than the ones that the orientation leaders had told me about. Not to be exaggerating, there are many resources, mostly free of charge, on campus that students can use frequently and unlimitedly to help ease their lives, allowing them to have the best experiences at U of M. For example, there’s a front desk and help center in almost every building on campus where students can feel free to ask questions. There are also human resources such as academic advisors, GSIs and professors. They are available by appointments or during their office hours to help students with homework problems or to answer their questions. One of my goals in college is to stay healthy. Besides me working out regularly and eating healthy food, I definitely need a clinic where I can get my flu shots or physical check-ups. I’ve fortunately had great experiences at the University Health Service (UHS). 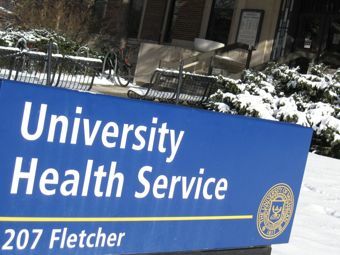 They provide the best health service to students as well as neighbors in Ann Arbor. Unlike hospitals, UHS is smaller in size but it has almost everything a hospital has and moreover, there aren’t any waiting lines. Few days before last Christmas, I unfortunately had bronchitis. In the beginning, my throat hurt so badly that my roommate was worried I had strep throat which could be contagious. So I decided to go to UHS right away. Although I didn’t make an appointment, I didn’t wait long. After ten minutes filling out applications, I met with my doctor. He was very friendly to me asking my symptoms. After checking the back of my throat, he reassured me that I did not have strep throat and prescribed me antibiotics and cough syrup. I was happy that I got my medicine in no time. Ultimately, UHS is the first place I will go when I’m feeling sick or in pain. Despite its size, it offers treatments for many kinds of diseases as well. Moreover, it looks relaxing, not frightening, and all physicians there are nice and helpful to their patients. Besides having a strong body, I want to be on top of my classes too and get good grades in college. No one wants to fall behind! So there’s CTools, a website that I use frequently to get connected with my professors or to check my recent homework assignments. It is in fact very helpful and convenient. Many professors at U of M have registered their courses on this website and put up all the materials covered in class, updates and assignments there so that you can simply log in, click the tab that says the course you are currently taking and use it to check out new homework, drop off assignments or download study materials. It’s quite versatile and sophisticated. For some professors, they even open a chat room on this website where you can ask questions directly to the professor or people from your class. It’s similar to facebook chat! I fell in love with the website after I discovered all of its functions and offerings for my classes. I currently use it everyday to check my homework assignments and their due dates so that I can plan everything out ahead of time and get everything done on time. Moreover I use it to download lecture slides and course handouts for studying after class. It’s very convenient because you can basically do anything on it without having to make appointments with your professors. When I was sick in high school one time for a week, I had to borrow my friend’s notes and copied everything down on my notebook afterwards. I also had to ask my teachers for handouts that I’d missed as well as turn in my late homework assignments to my teachers. With CTools, everything is within my control. I can still submit homework assignments on time and download handouts so I won’t miss anything even if I’m sick. Lastly, I need to have fun in college too. Parties, Sororities, Clubs, Organizations and etc; I want to join them all! But as a freshman, I feel very excluded to all the good stuff. However, Festifall has provided me with valuable information that I need to get involved in the groups that I’m interested in. 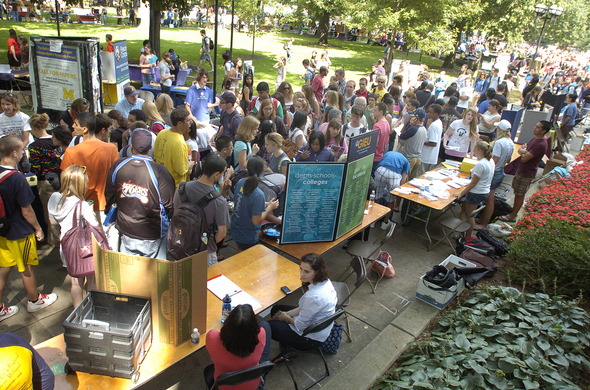 It’s a popular event in the beginning of September where many of the clubs, academic fraternities, and organizations gather around and give away information flyers to people so that they can have a better understanding about the club, fraternity or organization that they are interested in. It only lasts a day; however it’s hard to miss because it is packed with people and like its name, it is indeed very festive. Free popcorn, free popsicles, free samples and even free t-shirts and free planners are given away. It is definitely beneficial for freshmen who are new to U of M to find their alley and make some new friends. Personally, I learned about Ski/Snowboarding club from Festifall and I couldn’t be happier because I love skiing and snowboarding. So I signed up immediately and got an email the next day for upcoming events. I believe that being part of the club has been one of the best decisions I’ve made and I have since met so many people and made new friends. This MLK weekend, we went to Blue Mountain Ski Resort in Canada. It was a great memory for me and I couldn’t thank Festifall more for introducing me to this club. There are more resources offered at U of M than the three that I’ve listed above. However, these are the ones that I have received the most benefits from in order to achieve my goals in college. I’ve enjoyed them all; although if I have to pick a favorite, I have to say that I think Festifall is the best amongst all because who doesn’t like to have fun in college and make tons of friends? Without Festifall, I honestly wouldn’t be able to meet all these new people who I befriended with in ski/snowboarding club and had a wonderful time traveling to Canada. It is a great resource, especially for freshmen, to learn more exclusive information about what U of M is offering to students on campus as well as to meet new people of the same interests. I’m truthfully thankful for Festifall and I think it is in fact a brilliant resource at U of M.